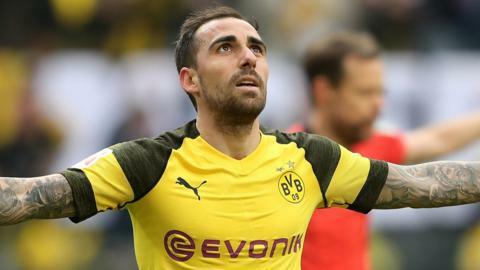 Borussia Dortmund score two late goals to beat Wolfsburg in the Bundesliga and leapfrog Bayern Munich, who drew at Freiburg, at the top of the table. Bayern Munich go top of the Bundesliga for the first time since September by thrashing Wolfsburg 6-0. Borussia Dortmund remain unbeaten at the top of the Bundesliga, with England winger Jadon Sancho playing a key role in their goal. Robert Lewandowski scores twice as Bayern Munich end their four-game winless run with victory at Wolfsburg. Liverpool striker Divock Origi, on loan at German club Wolfsburg, misses an open goal from just a few yards out against RB Leipzig in the Bundesliga.